the question that has been asked so many times of me lately is whether i was paid for the now iconic photo of the condura run. 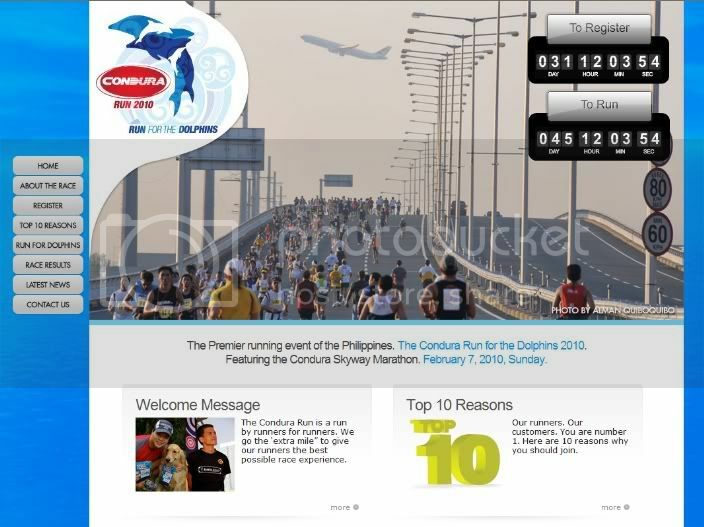 my response has been consistent: when ton concepcion expressed interest in one of my photos of last year's run for the whale sharks, i so generously gave it for free, and being the lawyer that i am, even provided the parameters of its use: to promote the condura run, provided that i am credited as its photographer each time. a few thousand pesos can go by rather quickly, but the attention and the fame that goes with the photo linger. what i've gotten instead is priceless: the mileage that one photo has given me has been unmeasurable. and surprisingly, i am always not the first person to find out that i've been getting publicity. 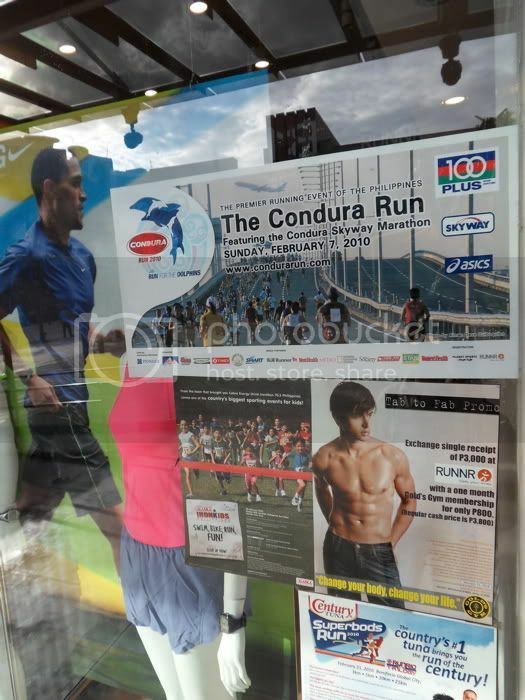 last december, ike told me about the photo being part of the banner of the condura run for the dolphins 2010 website. i was simply thrilled. 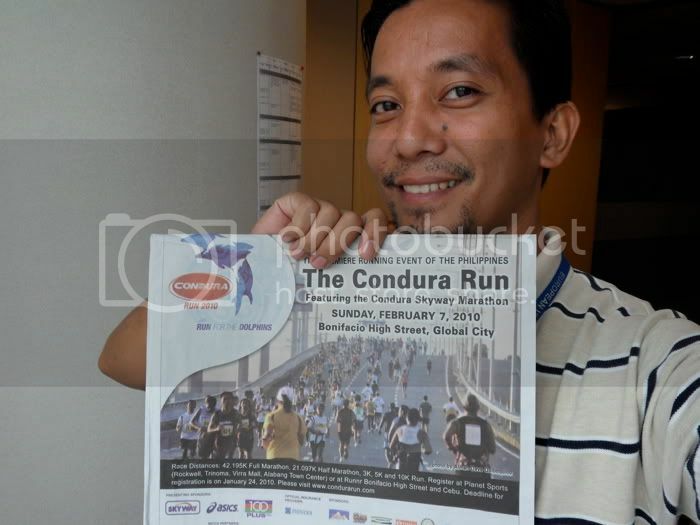 early this january, several friends told me that a poster was displayed outside of runnr store in bonifacio high street. i got even more excited. then on my way down from mount natib, momoy informed me that there was a half-page splash on the philippine star with my photo. could this get any better? it does. 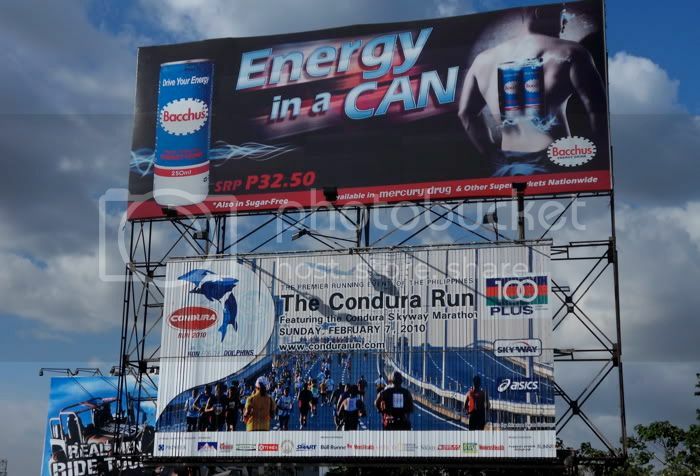 a few days later, joni sent me a message saying that my photo is on the rotating billboard along EDSA near quezon avenue. i was delirious. but to be honest, it is technically not the best image that could have been produced given the circumstances: the lighting could have been better, the horizon more aligned. i should have chosen sharper focusing on my foreground, and allow the trail of runners including the plane to blur as part of the background. the framing may also have been improved if i stepped a little to the left and super-zoomed to eliminate the lane without runners. but as it were, i had no time to think. 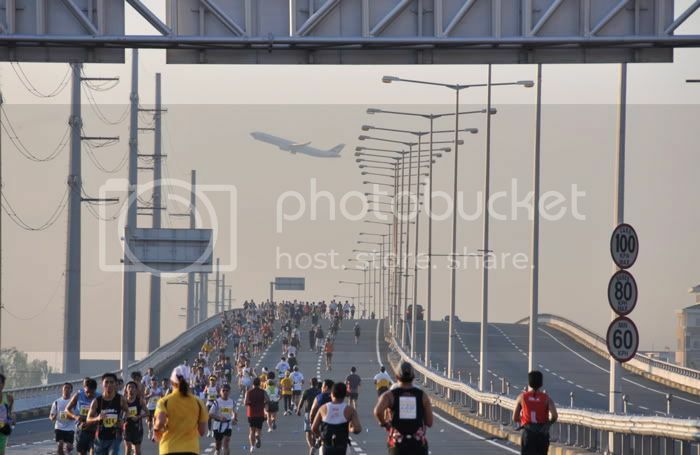 i was running on the skyway with a nikon D300 and an 18-200mm lens. very heavy piece of equipment. in the end, it was my mobility that gave me an edge over other photographers. i've always said that opportunity (noun. a possibility due to a favorable combination of circumstances) makes for good photography. all the technique and the equipment may not be sufficient. i know of photographers -- masters in their own right -- who doggedly pursue such opportunities. in my case, without expectation, the opportunity presented itself, and i took one snap. to be honest, this isn't the only photo i have of last year's run with a plane taking off in the background. i had several. but the confluence of elements helped turn this into something bigger than i ever imagined. yes, my photos have appeared on magazines, the internet, and national dailies. but how many people i know can say that they have a photo on a billboard in EDSA (i know just one person)? thanks condura for getting me this much attention. would it be pushing it if i asked for an airconditioning unit? or maybe a refrigerator? hu-wwoooooooooow..... congratulations. i'm sure nakaka excite yan! thanks. gusto ko nga tumambling sa EDSA eh. haha.